I sleep on the way to Whitby and by the time we arrive the sky is grey, the same colour as my skin. Woozy from the detox and the nap, I watch Midge navigating purely on instinct and Jon’s suggestion. We hadn’t booked a B&B thinking that this late in the season there would obviously be plenty. I get out of the car. Jon clearly doesn’t want to speak to the owners on his own. “I don’t know mate, words difficult me for a bit,” I stumble. “It’s okay just hang back, I’ll do the talking,” he says, unsure. We walk to the nearest house with a sign and ring the bell. A man answers wearing a thick fishing jumper that he probably only wears for the tourists. “Hi, we’d like a room for the night,” says Jon, noticeably cheerier than when he was talking to me. “Just you two is it?” he says suspiciously. “Nope, our friend in the car as well,” says Jon gesturing to Midge. “No we’d like to share,” says Jon, probably thinking about the dwindling pot of money. The ‘you’ is pointed. At the time I was incensed at the sly homophobia but looking back it may not have been the possibility that we were just gay. It could have been how gay we were: an unshaven mod bear taking his grey detoxing chicken in a Hawaiian shirt to a room with a pierced leather midget to do who knows what. It never occurred to us that we’d have any trouble finding a room so walking down the street looking at the ‘no vacancy’ signs starts to panic us a little. My shyness and paranoia are kicking in a lot, as have various ticks. Annoying recurring thoughts about my inadequacies are all I can muster. I’m lonely and try to think about good things:cats, dogs, babies. That’s the only thing I can do to control it, and if the thoughts get really bad then I have to sort of shout it to myself like a mantra ‘cats and dogs and babies, cats and dogs and babies’; they’re good things, good things happen when you’re with them, they’re warm, things are simple. Midge decides there’s better parking round the corner and I will a silent Danny to stand near me as I ring the doorbell of a potential place to stay. There’s no answer, but we can hear the rumbling of a cider tramp sitting on a stoop across the way. There’s cackling and there’s talk of werewolves. And there’s no answer. One of us must look pregnant with our saviour as a procession of innkeepers turn us away. Their reasons are increasingly bizarre and their speech has the patterns of someone making up excuses on the spot. “Try Mountbatten house across the way,” referring to a place we’ve already tried and been moved on from. I check the web for nearby campsites, but there are none: which is reasonable when you think how cold it must be this far north at this time of year. We round the corner and I look for Midge and my red Renault, but it’s not where I think it should be. Has he decided to bugger off, take our car and money? We don’t really know him that well and he’s had a week of not fun. Has he snapped? My heart and mind are turning over. Dan is non-communicative. The painkillers are killing most of his vital signs. I was thinking we might have to sleep in the car, but now even that’s not here. The next place that answers the door, are apparently having issues with their boiler, but I guess that was a lie. We try the next street and the next, until, rapidly running out of options, we come to Kimberly House. 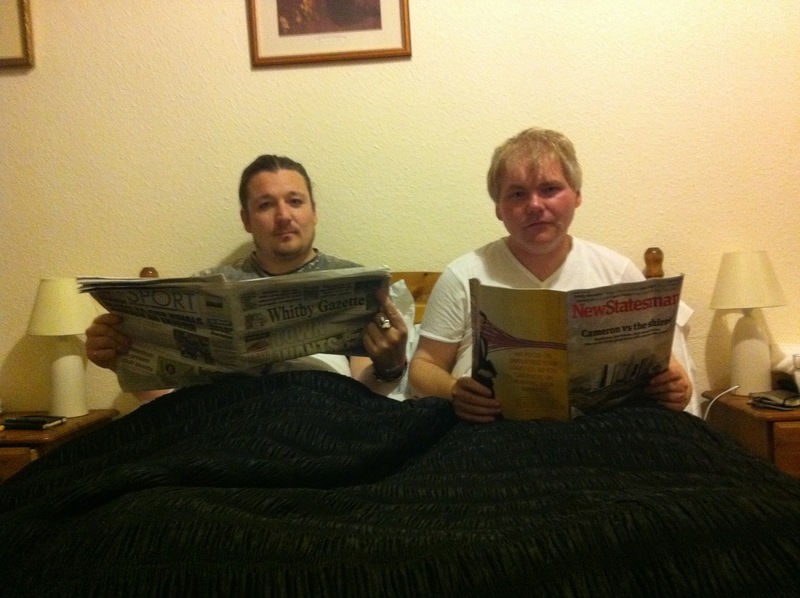 Even in our tired and worried state both me and Jon take time to do our best Victoria Wood impression. ‘My friend Kim-ber-ley’ – we pronounce the exaggerated northern vowels – ‘my friend Kim-ber-ley yer know with the big dang-ley earrings.’ Cheered by this we ring the bell. No one answers for a while and we’re about to leave when a woman in a red top and apron answers the door. “Hello” she says in a broad northern accent. Me and Jon grinat the coincidence. Jon asks about a room and she lets us in. She tells us that she only has a double with a kids bed but we take it,explaining that we don’t mind ‘Morecambe and Wiseing it’ and delightfully, she seems to know what we mean. She has a welcoming smile and an accent that places her somewhere in Lancashire. I feel safe. I feel sitcom safe. I’m happy to pay, now after all the problems, a price nearing a hundred quid for a ‘family room’ (one double and a single) which is the cheapest way we can sleep three. It goes on my credit card. I go out to the car – which was exactly where we’d left it – to fetch Midge and bags. Danny negotiates the stairs and heavy fire doors with something that isn’t quite ease. After any time camping the novelty of being indoors is hard to shake. I lie on the bed and feel my spine unclick. “Why do I get the kid’s bed?” says Midge redundantly. “Wouldn’t surprise me,” says Midge, unpacking his sleeping bag. “Making my bed,” says Midge as he unfolds the bag on top of the bed. “You can use the sheets,” I tell him. “It’s all part of the price.” He looks confused. A toilet flushes and Jon comes out of the bathroom. “Midge, do you want the next shower? I’m too comfortable to move at the moment,” and, I add in my head, “I know what Jon was probably doing in there for the last ten minutes”. “Cheers, Dan,” he says, grabbing his towel and wash kit. There’s a knock on the door, me and Jon freeze. We weren’t doing anything we shouldn’t, but I think we’re just kids at heart really waiting for the grown-ups to tell us to stop it. It’s the woman who runs the B&B, a lady whose name we learn is Rachel. We all check her out as she bends over. Terrible but true. I’m really looking forward to the bed, even if I have to share with Dan. It’s more sitcom material, although nothing really noteworthy happens, as I’ll tell you later. We try to engage Rachel in conversation, trying to find out how she came to be running a guest house on the other side of the country from where she’s from. Danny does best, as he pretty much always does in conversation. I stare through the net curtains, across the dullness and the gathering night.